Hello, it’s Megan from Homemade Ginger again and I’m back to share a beautiful watercolor art project that is perfect for Halloween! 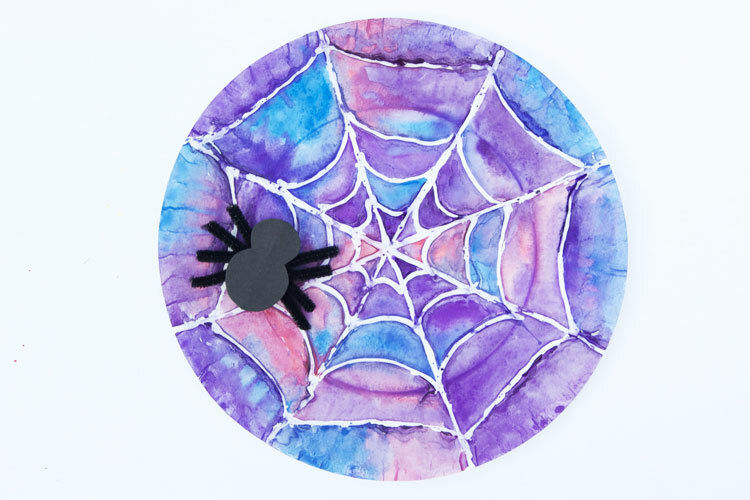 These watercolor spider webs are so fun to make and they turn out great every time! I love playing with watercolors. Even though I’m a grown adult, sitting down with a tray of watercolors and a blank piece of paper is so fun and calming. I’m not a skilled watercolor artist by any means, but I just love the way that the colors bleed into one another and create new shapes and textures. Painting with watercolors is one of the things that I love doing with my kids. I’m not always eager to play toys with them, but I’m always up for painting! Watercolor painting can be frustrating to kids (and adults) because it’s difficult to control the paint and the colors can easily become muddy. The key to painting with watercolor is to choose colors that are similar to each other and won’t become brown if they mix, and to allow the paint to flow and do it’s own thing. 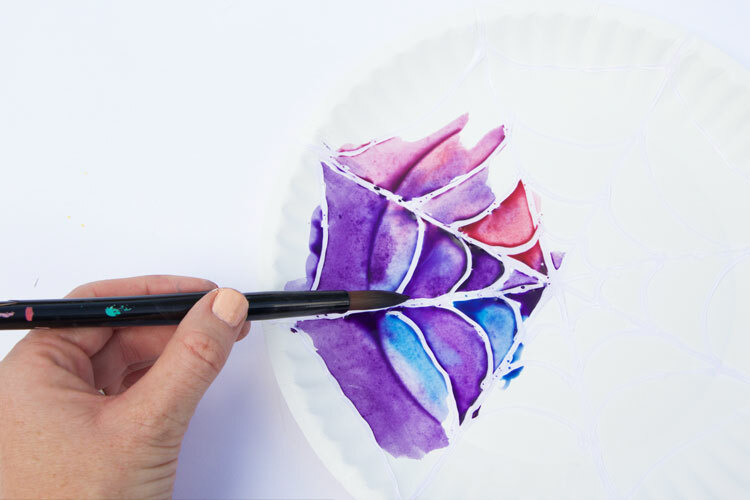 This spider web painting is perfect for that. There is really no way to mess it up and kids of all ages can end up with a beautiful painting that they will love! The secret to achieving the bright white lines for the spider web in this painting is hot glue! 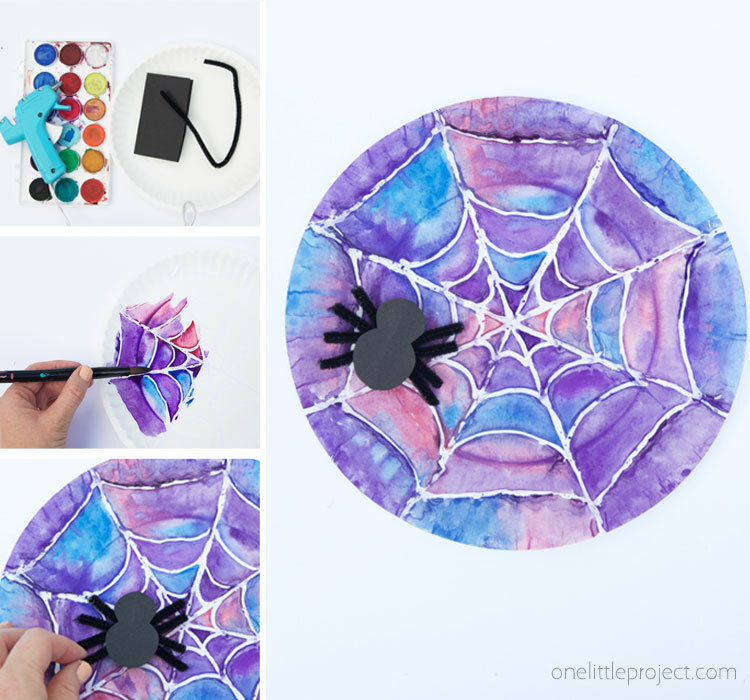 Older kids can do this part themselves or a parent can “draw” the spider web on ahead of time for younger children. 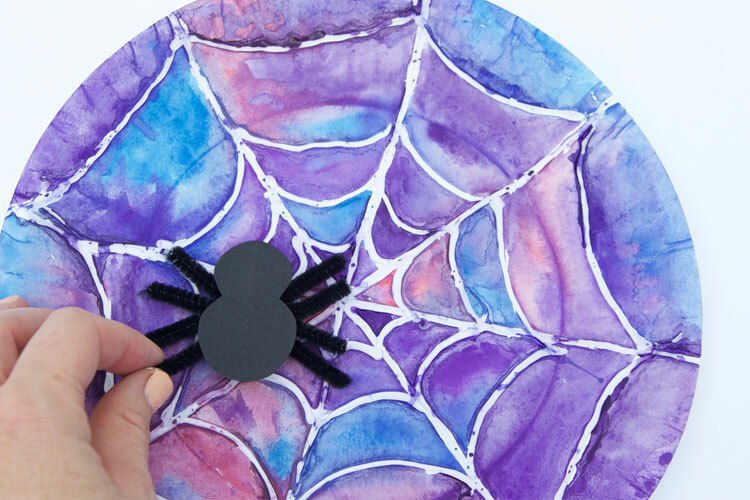 Add a spider on once the painting is dry to make this sweet spider web that is anything but scary! 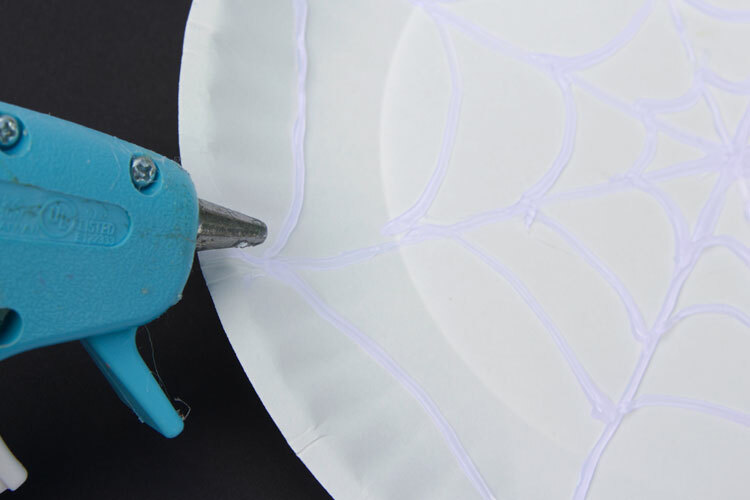 Begin by drawing a spider web onto the paper plate with a hot glue gun. Make sure the glue lines are fairly thick to achieve a brighter line after it is painted. After the glue is dry, begin painting in between the glue lines. Use just a few colors that are similar to each other (like blue, teal and pink) for best results. Dark and bright colors also work best. 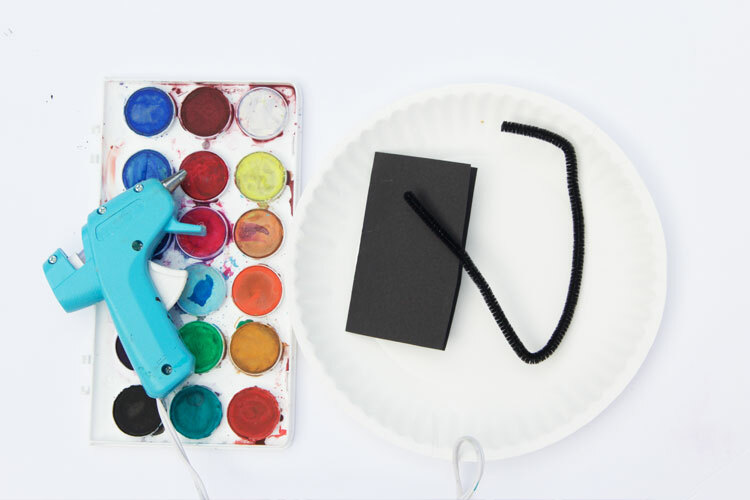 Paint the entire paper plate, allowing the colors to bleed into one another and allow it to dry. 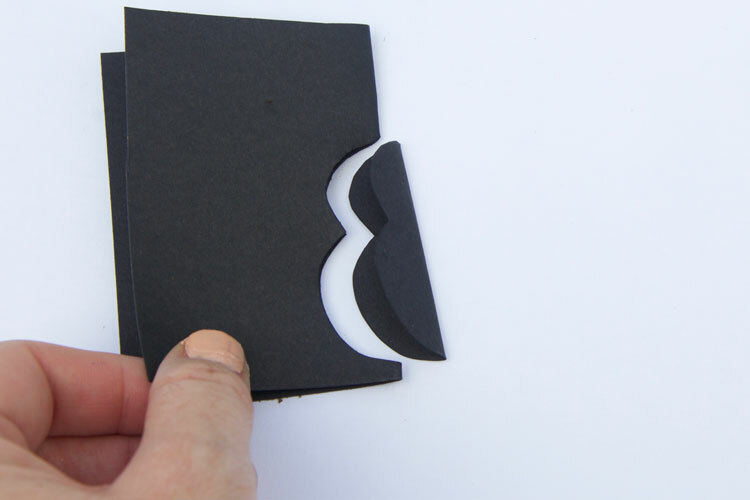 For the spider, fold a piece of black paper in half and cut out the body of a spider. Twist 4 pieces of pipe cleaners together to create legs and glue it onto the body of the spider. Glue the spider onto the web. These spider webs are just so lovely! 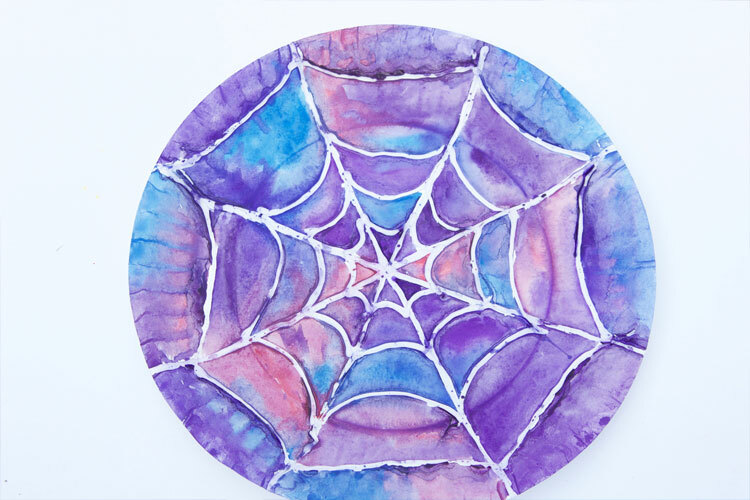 Create this beautiful watercolor spider web just in time for Halloween! This would be a great project for a Halloween party, or you could make it any time of the year!